Litwiller Renovations is committed to building green, sustainable homes for clients in the Calgary Area. We are proud to have received our BUILT GREEN® certification. 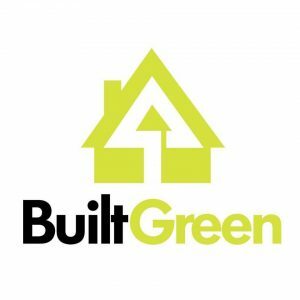 BUILT GREEN® Canada is a national, industry-driven organization committed to working with builders interested in responsible sustainability practices within the residential building sector. Why are the benefits of having a house certified through BUILT GREEN® Canada? A certified BUILT GREEN® home comes with a reduced monthly operating cost, eligibility for an automatic 15% mortgage loan rebate, and more. A more efficient home means you benefit from savings on utility bills; such as water, gas and electricity. An increase in durability also means you have to renovate less often, saving you more money in the long run. Homes with green certification are also likely to sell for on average 10% more than non-certified homes. On the topic of sales, in certain jurisdictions where energy assessments are conducted before a home is sold; having a home certified through BUILT GREEN® Canada can save the homeowner around $300-500 depending on location. For those with allergies, a BUILT GREEN® certified home provides additional benefits in the form of less stress on your respiratory and immune systems. Improved air quality can be attained by choosing options like VOC and formaldehyde free building materials, third-party certified floor coverings and special heat recovery ventilators that circulate air whilst removing allergens. The Build Green certification program pays special attention to a home’s airtightness and ventilation which ensures the least amount of dust and toxins enter your home and generally improved air quality. Additional options like triple-paned windows also provide an extra layer of air tightness as well as having their own benefits like superior insulation (increasing energy efficiency) and a significant reduction of outside noise entering the house. One of the most overlooked aspects of a sustainably built home is durability. BUILT GREEN® homes benefit from a wide variety of features that improve a home’s durability; from specially engineered warp resistant lumber, 30-year lifespan roof shingles to specially waterproofed foundation walls. We aim to make sure that the homes we built won’t require significant renovation work done every few years. BUILT GREEN® certified homes are built to be resource efficient in the construction phase as well as in the everyday operation of the home. A few examples of how our homes are built more efficiently include the use of energy efficient furnaces and air conditioners, special windows and Energy Star rated appliances. The use of Light Emitting Diode (LED) as well as Compact Fluorescent Lamps (CFLs) linked to timers and motion sensors also help improve a home’s energy efficiency. Features such as xeriscaping, water-saving toilets, low-flow showers and faucets among others also help our homes become more water efficient. All of this and more contribute to a more efficient home with less environmental impact when compared to traditionally constructed homes.